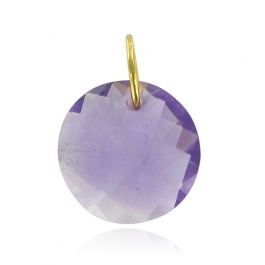 Part of the Leo Collection; this gorgeous faceted amethyst pendant is set on an 18k gold vermeil hoop. The pendant measures 14mm in diameter. Pendants are a key look this season. Wear on a gold chain to create a stunning statement look. Also add the Leo Amethyst earrings for a perfect set.